Winter weddings can be gorgeous and magical, but finding what to wear can be a challenge. Let’s be real. It’s hard to pick a dress no matter what the season – but when you’re heading to a winter wedding, things get even more complicated! What do you do when it’s freezing outside and you still have to look elegant and put together? Why, throw on a fur of course! They are a timeless, classic cover-up for winter wedding guests (and brides!). Nothing better than something that keeps you warm and oh-so glamorous at the the same time. It’s funny that I posted this particular look today, because this weekend we are throwing my sister’s Bridal Shower! Follow me on Instagram to see a sneak peek of the festivities! Have a great weekend!! A fur adds a sweet warm touch! You are a vision and that Bag! I saw it and loved it, so happy to see it in action. Those dress pleats are everything! You are so gorgeous, enjoy the shower festivities and hope the weekend is as sweet as you are! This look is gorgeous and so winter wedding appropriate! How amazing is that bag?? You have another sister getting married? How fun!! Omg, your little cake Kate Spade! I am loving it- perfect for a winter wedding! As always, the perfect outfit! How cute is that purse? Have so much fun throwing your sister her shower, what fun! oh my !!! I’m totally in lve with this whole outfit/look <3 your hair looks beautiful, your dress and bag are way too pretty to express. You made winter wedding style so effortless and glamorous. Thanks for the inspiration. You never seize to amaze me with your amazing style. 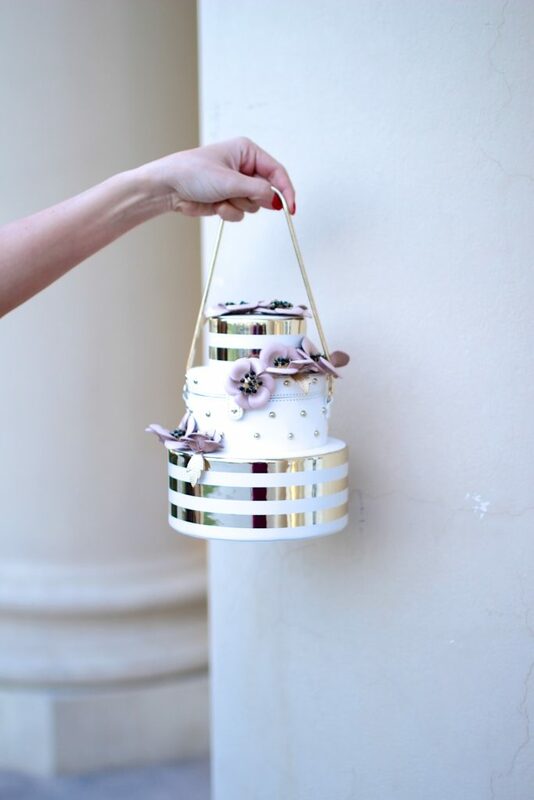 Totally crushing over this glam dress and that cake bag is just darling!!!! Your bag is so so cute. What a gorgeous dress and such a cool bag!! Love this look on you! You are so right, winter weddings can be challenging to dress for. But, this look is absolutely perfect! 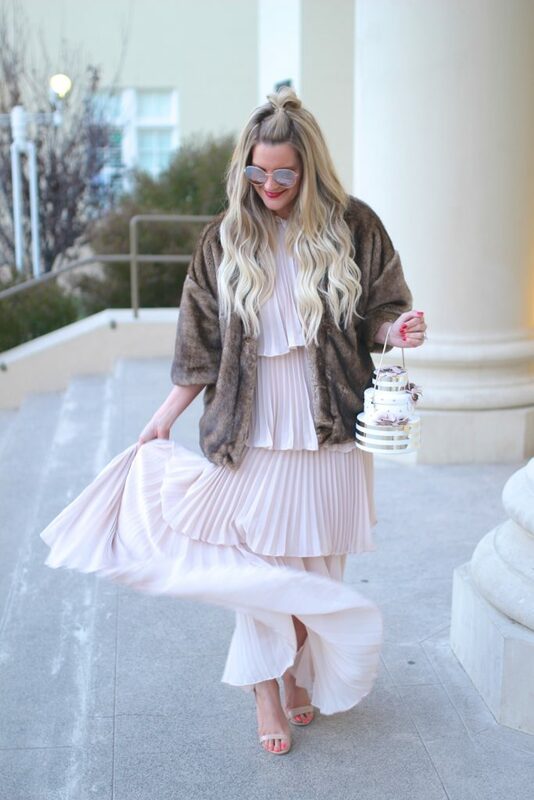 I love the fur coat over this dress and how adorable is that bag?! I saw that bag online and so wished it was around when we got married haha! Good luck with your sister’s bridal shower this weekend. I’m sure everything will be perfect! Happy Friday, Shauna! This dress is beautiful and I love it with the fur coat. 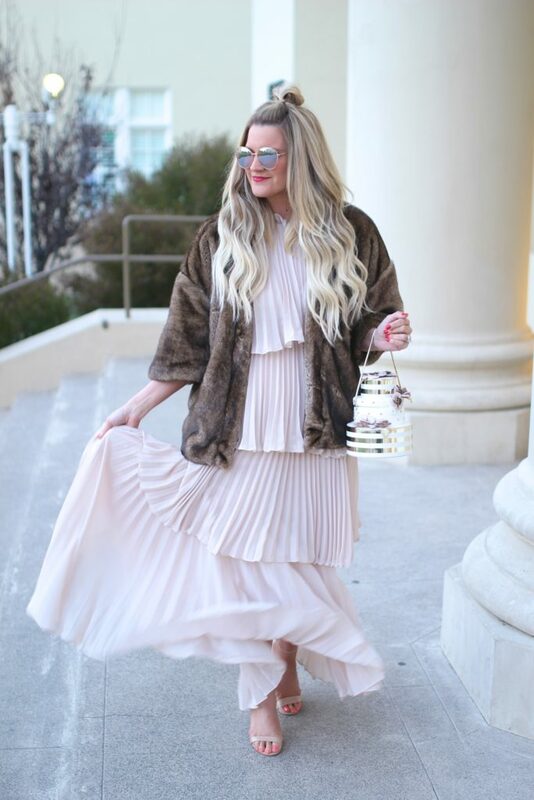 Such a perfect winter wedding look, and you look gorgeous! Such an inspirational outfit, love it! That coat looks so soft and cozy! I don’t think it has ever gotten cold enough to wear something like that here in Florida, haha! It’s perfect Shauna! And oh my gosh, that bag! How cute is that? This is such an adorable outfit dear, and that bag is absolutely the cutest!